When we think of dieting, we think of curing a chronic problem with a short term solution. We think that a diet will “cure” our excess weight. We take the “magic snake oil elixir” by mustering up all of our willpower and going hungry for weeks at a time. In order to keep weight off forever, you need to make long term lifestyle changes that are sustainable and enjoyable. There’s the key—you have to like them and feel like you can keep them up. No one can keep up willpower and hunger forever. 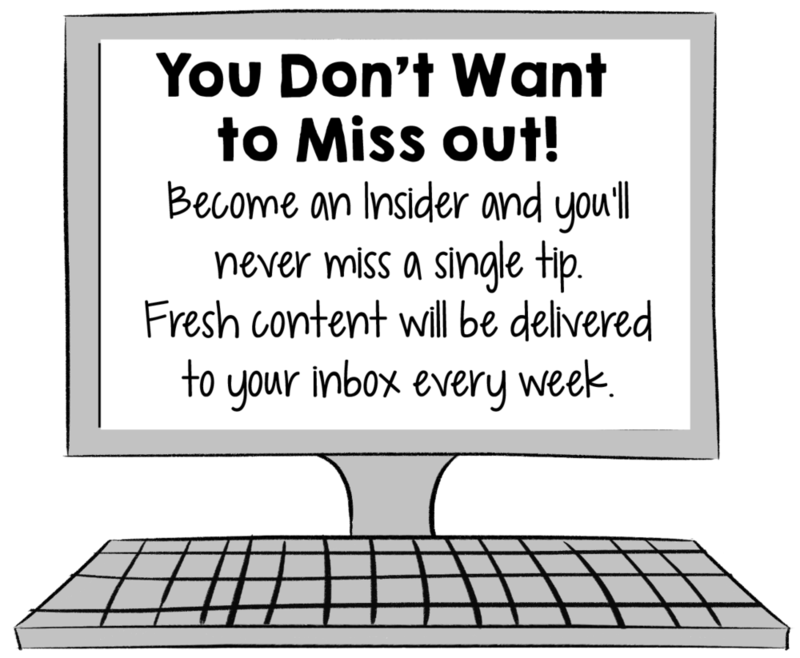 So here’s how to make changes that you can keep up forever. "Why Can't I lose weight and keep it off on my diet?" 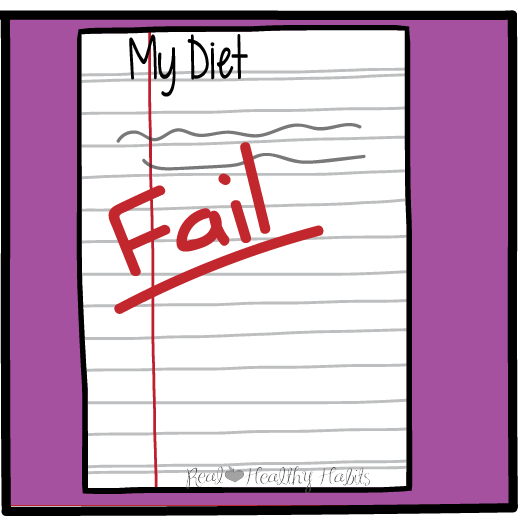 Have you failed at dieting? There are other ways to lose weight (like the Real Healthy Habits approach), but when I talk about dieting, I mean a restrictive, lower calorie, food plan. A diet isn’t based on internal hunger signals. It’s probably not even based on anything about you like your body, your lifestyle, or your preferences. It's an arbitrary prescription of how to eat, what to eat, and how much to eat. And here’s the truly disturbing part about diets being ineffective… You’re not only doomed to gain it all back, you may even end up heavier for all of your efforts. 33% - 66% of people end up heavier after a diet than if they never dieted in the first place. Let’s say that you and your best friend weighed 170 pounds, and you decided to go on a diet. She didn’t. You went hungry, hit the gym, and lost 20 pounds on "the diet of the month." Your friend stayed the same weight. A year later, despite the hunger and all the effort, you end up heavier at 180 pounds. You now weigh more than she does. But you know what they say, “Life isn’t fair.” And neither are diets. So what’s going on here? Why don’t diets work? Isn’t that what we’ve been told to do? There are many problems with dieting. There’s the issue of hunger for one. Then there’s the adaptations your brain makes to prevent you from “starving” to death. Yes, your brain is overly paranoid about that. But, I think one of the biggest problems with weight loss is our mindset around dieting. When we think of dieting, we think of curing a chronic problem with a short term solution. Here’s what I mean: if you get high blood pressure, your doctor doesn’t give you a pill and say, ”Take one of these and you’ll be cured.” Hopefully some day in the future that will be the case, but we aren’t there yet. You need to keep taking the medication day-after-day or your blood pressure will rise. And it’s not because you don’t have enough willpower. Powerful biological forces cause your blood pressure to go up again. The same thing goes with your weight. We think that a diet will “cure” our excess weight. We take the “magic snake oil elixir” by mustering up all of our willpower and going hungry for weeks at a time. Only some of us are able to take off the weight with the diet. Once we go off the diet, we gain the weight back. And just like your blood pressure increasing, weight regain is caused by powerful changes in your body—not your lack of willpower. Neurological Changes— The food reward centers in your brain are amped up. You notice food more. And when you eat, it tastes even more amazing than you remember. 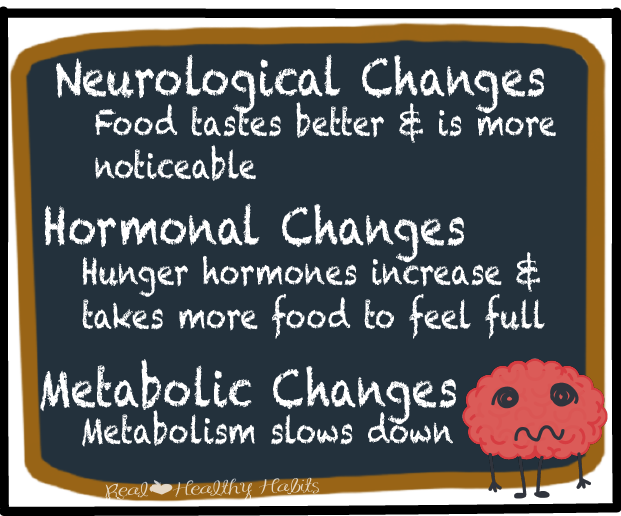 Hormonal Changes—The hormones that make you feel full go down (Leptin) and the hormones that makes you hungry (Ghrelin) go up. So you brain wants to eat even more than before you dieted. Metabolic Changes—Your metabolic rate takes a dive. This was big news recently when the winners of the Biggest Loser were followed up years later after the show, and researchers found that their metabolic rates were slower by 500-700 calories than other people their height and weight. So if you want to lose weight and keep it off for the long run (who doesn’t right? ), you need to change your approach. You need to do like you’d do with your medicine—keep taking it. You need to keep doing day-in and day-out what you did to lose the weight in the first place. And there’s the problem with dieting. If you needed to diet forever, you’d never be able to do it. That is why only 5% of people who diet keep off the weight. There’s only 5% of the people who can deprive themselves and go hungry forever. But for the rest of us mere mortals, we need to change our lifestyle. I know you’ve heard that phrase before, “change your lifestyle.” It sounds so dismal. “What? I need to deprive myself forever?,” you may wonder. I get why no one wants to change their lifestyle. It’s so ambiguous and so forever. At least with a diet, you only need to deprive yourself for a short while. That’s why I teach you to not deprive yourself. Make lifestyle changes that are sustainable and enjoyable. There’s the key—you have to like them and feel like you can keep them up. No one can keep up willpower and hunger forever. If you’ve ever “failed” at dieting, remember that your weight regain isn’t a matter of willpower. Also, you’re in good company (the 95% of us that have ever dieted), and there is another way. If you want to lose weight and keep it off, try something different. Real Healthy Habits is a habit based approach that works with your body, your brain, and your hunger. I’ll teach you how to make personalized habits that work with your body, your brain, and your hunger. Take your first step to losing weight without dieting. Download this guide-- Six Simple Steps to Eating Less, Feeling Full & Losing Weight --Starting with Your Dinner Plate!